RStudio addins were released in early 2016 to provide anyone with the ability to add “extensions” to RStudio. This feature has quickly become popular, but discoverability was a problem: there was just no easy way to know what addins exist. To address that issue, one month ago I created a GitHub repo with a list of RStudio addins that was meant to serve as a resource for discovering (and showcasing) RStudio addins. This repo received a lot of feedback, mainly around the idea of developing it into a package that would allow users to browse the addins and install the ones they find interesting. So that’s what I did. The package is called addinslist. 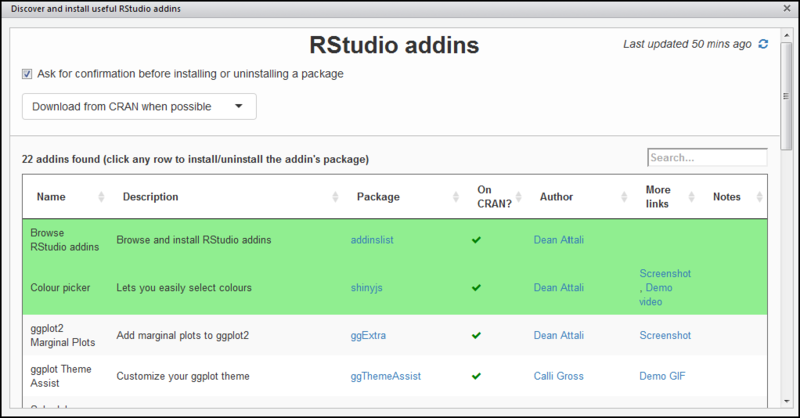 If you install the addinslist package (with the command install.packages("addinslist")), your RStudio will gain a new addin in the Addins menu called Browse RStudio addins. The screenshot below shows how to access this addin. If you want to add an addin to this list, feel free to make a pull request on GitHub. I should mention that Colin Gillespie actually thought of this idea first and created a similar addin, but unfortunately I was not aware of it until after my work was done.